This week's House Mouse Challenge was to make a bag or box. 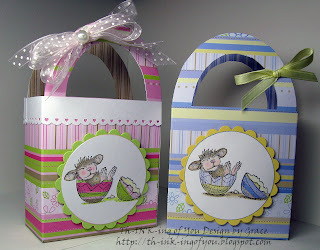 I thought these pretty Heidi Grace papers I had gotten at ACMoore would make cute little Easter treat bags. I used a bag I already had and traced it for my pattern. I stamped the images with Archival Jet Black and colored with Prisma Pencils, and blended with goo gone. (Thanks Dawn for that tip... it worked pretty well on the GPW CS). I paper pieced the egg shells. I used my Stardust clear glitter gelly roll pen... I think I use it on everything! Unfortunately I can't seem to get a good photo of these guys. My make shift light box is not able to get adequate light to both bags at the same time. It's dark outside, so I'm just not getting a good photo. It's not supposed to be sunny here until Sat. so this will have to do. These were fun to make and I think these little bags could have lots of possibilities. If you'd like to play along on the House Mouse Challenges, click on the little HM Banner on my right side bar. Thanks for taking a peek! Have a great night! Wow, Grace, these bags a too cute!!!! May I ask where you got the pattern/template for the bags? Love those Hpuse of Mouse stamps. These are just adorable, wonderful coloring, House of Mouse Images are too...cute. wowww Grace,what a beautiful box,l love the papers. Now you know that I LOVE these. So stinkin cute! Great springy bags!